A large area of convection remains in the northwest Caribbean Sea. It is in a similar location where Alex developed several days ago. Yesterday a buoy in the western Caribbean reported a wind gust over minimal tropical storm force briefly. Seas were up to 9 feet. Since then, seas and winds have calmed down. Pressure is dropping slightly north of Honduras, so we are on the look out for a surface low to develop. Interests in the northwest Caribbean should follow this disturbed area of weather. 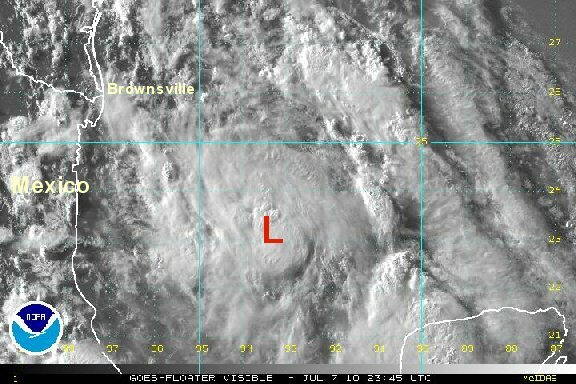 Low 96L still has convection, but unlike Alex, it is still disorganized in the northwest Caribbean Sea. There is still not enough here to warrant a full update. Heavy rain is spreading into the Yucatan peninsula. It doesn't look like a good beach day at Cozumel or Cancun. Interests in the northwest Caribbean and Gulf should follow the progress of this low pressure system. Low 96L is moving across the Yucatan peninsula and into the Bay of Campeche. There is still a chance of development as it moves toward the west northwest on a very similar path that Alex took. Conditions still do not warrant a full update. Interests in the western Gulf should continue to watch this tropical disturbance. At 8 pm edt / 7 pm cdt the disturbance was centered at 23.5° N / 93.5° W or about 255 miles southeast of Brownsville, Texas. It is moving west northwest at about 15 mph. Top sustained winds are estimated at 25 mph. Forecast models take this disturbance into extreme south Texas by Thursday. All interests in northeastern Mexico and Texas should follow this disturbance closely. Tropical depression 2 was officially classified overnight. It is heading toward the Texas / northern Mexico border or slightly north of there and should make landfall later this afternoon. Deep convection is starting to rebuild around the center of circulation and the depression may have enough time to cross land as a minimal tropical storm. The greatest impacts will be some locally heavy rainfall with the thunderstorm clusters. Keep in mind, with weak tropical cyclones it is not as important where landfall occurs. Effects are usually spread out and not as organized. 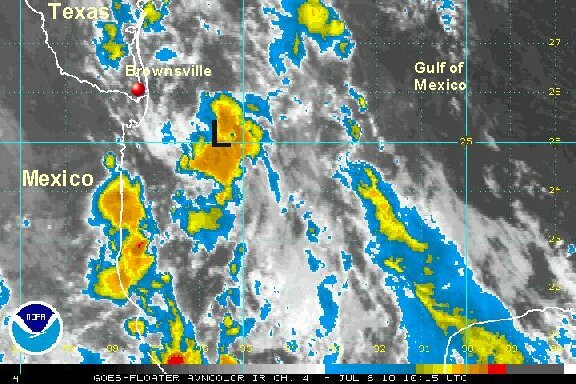 At 7 am edt / 6 am cdt the depression was centered at 25.1° N / 95.6° W or about 125 miles east southeast of Brownsville, Texas. It is moving northwest at about 15 mph. Top sustained winds are estimated at 35 mph (NHC 35 mph). Tropical depression 2 will be inland in the next couple of hours. Deep convection has continued to build near and southeast of the low. This depression would have been classified as a tropical storm if it had just a few more hours over water. Regardless of being classing as a minimal storm or not, the effects will be essentially the same.... some breezy weather with heavy downpours in the thunderstorm clusters today into tonight for south Texas and northeastern Mexico. 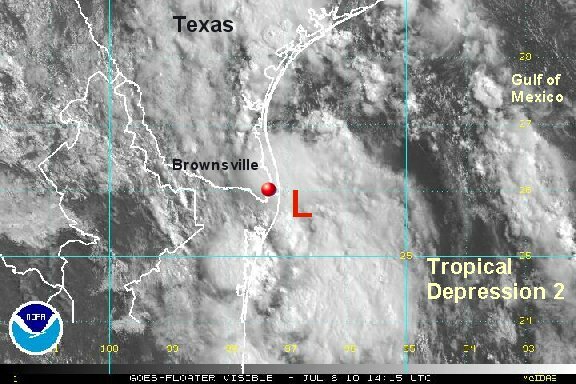 At 11 am edt / 10 am cdt the depression was centered at 26.0° N / 97.0° W or about 30 miles southeast of Brownsville, Texas. It is moving northwest at about 15 mph. Top sustained winds are estimated at 35 mph (NHC 35 mph).